I have faced my domestic challenges these past few days. Yesterday my coffee maker died. The hot plate on the bottom just melted away from the sides. So the pot was too low to lift the bottom of the basket to let the coffee drain into the pot. It overflowed, with the grounds, and ruined what coffee was run through. So...long story short, I had to run to Wal Mart to get a new coffee maker so I could have my morning fix. Never fear, I am fully caffeinated now. 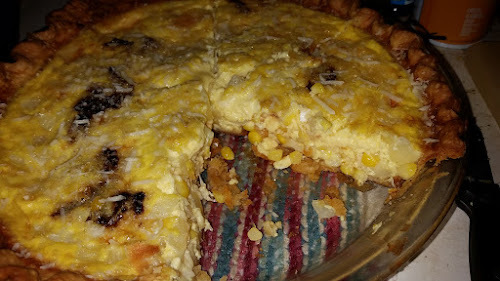 Since I have had 13 eggs in the last two days, out of seven hens, I decided to try a quiche for supper. Hubby wouldn't want any (cheese and such you know) but since he would be gone to the auction, and Younger Son was leaving for work an hour early I decided to try one. One of my new egg cookbooks had basic instructions for improvising a quiche with whatever you have. Well, I had a can of asparagus, and one of mushrooms I thought. But they were awol. So I cut the kernels off an ear of corn, and sautéed them with an onion. I had made the pie shell, covered the bottom with Swiss cheese and added the veggies. Oh, and for flavor I added some chopped dried tomatoes. I guessed at the number of eggs because the oldest were assorted sizes. (One double yolker though.). Some salt, and mustard and milk. And it was surprisingly good. And I have leftovers for tomorrow. Also on the domestic front, I have not forgotten my Cactus Flower Gold Digger socks. 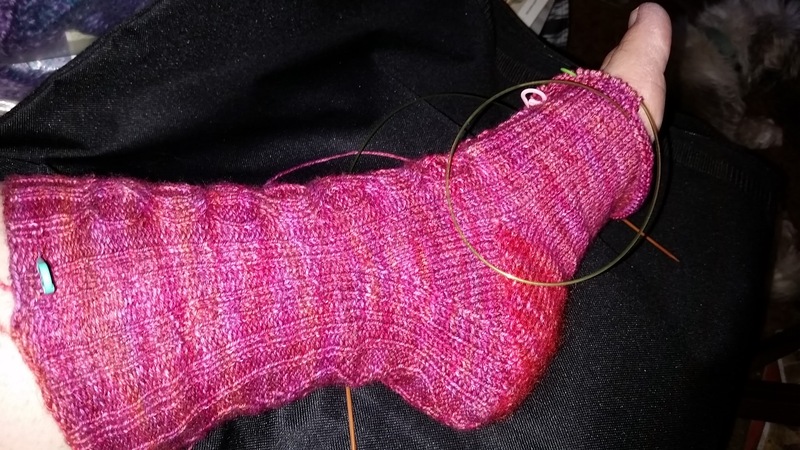 I cannot work on them once the sun is down, but I am making progress. 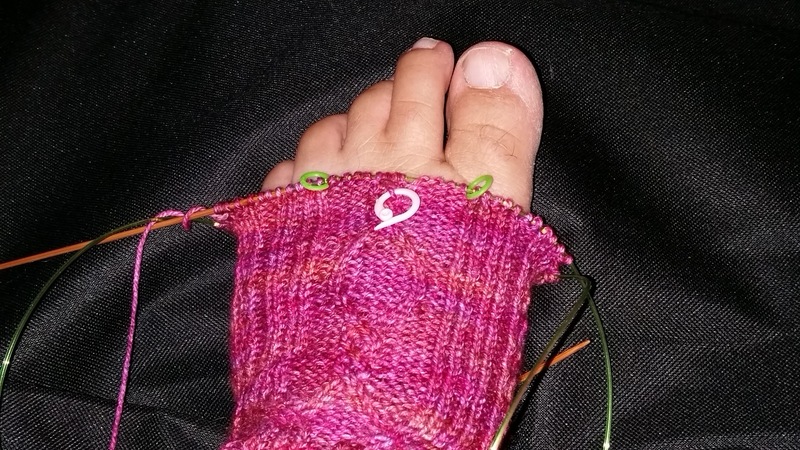 I think I am not far from starting the toe decreases. The traveling stitch pattern will continue down the toe till I graft it together. Then I need to start the second as soon as I can, to avoid second sock syndrome.